View topic - Lost all files due to linux installation. Lost all files due to linux installation. Post subject: Lost all files due to linux installation. 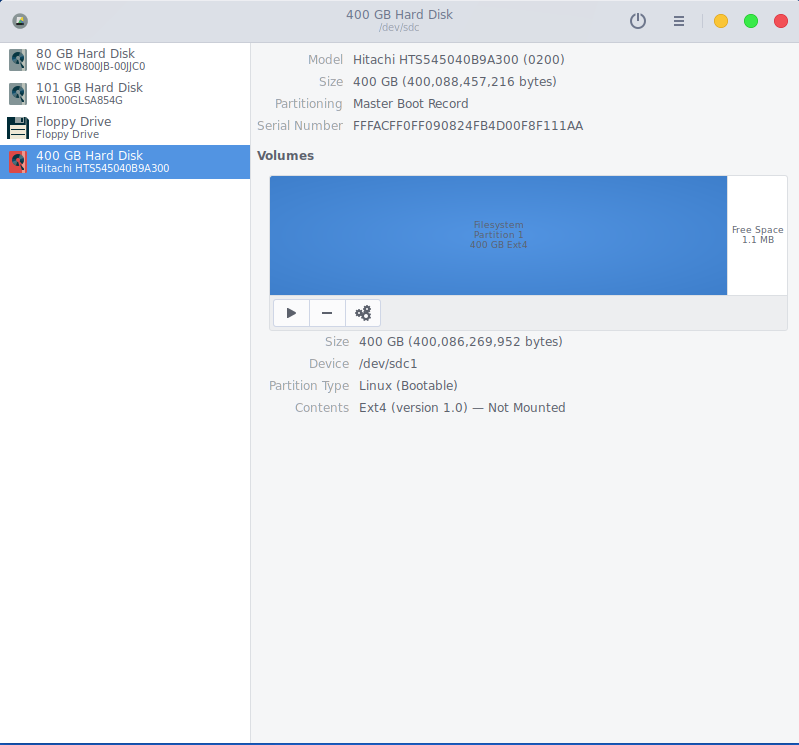 I'm trying this morning to install deepin linux (debian with deepin de) and I specifically chose my 100GB hard drive that I intended to use for this. Checked around 3 times it's the correct one. Moved on with the installation and when I rebooted I found out that it used also my 400GB hard drive (not partition, those are two separate hard drives) to install something onto it deleting around 350GB of data. Now the hard drive has a changed format, used to be NTFS now it's ext4 I think. What should I use and how to get those files back. Here's a screenshot of how it's showing in 'Disks' a disk utility for linux. The 80GB hard drive is an old 3.5" IDE drive, 101GB and 400GB are 2.5" sata drives. Post subject: Re: Lost all files due to linux installation. P.S. linux software is better (I guess) because recuva doesn't seem to recognize ext4 or should I delete all partitions off of it and format as ntfs or fat? This hard drive is now in USB enclosure so I can safely remove it when I install some stuff next time but it can be put back into the machine if needed. Files aren't that really important but it would make my d̶a̶y̶ month if I could get them back. I noticed that the hard drive had a bad sector but it never showed any problems whatsoever. I see that the last 1.1MB is free. Perhaps there is still a backup copy of the NTFS boot sector in that area? 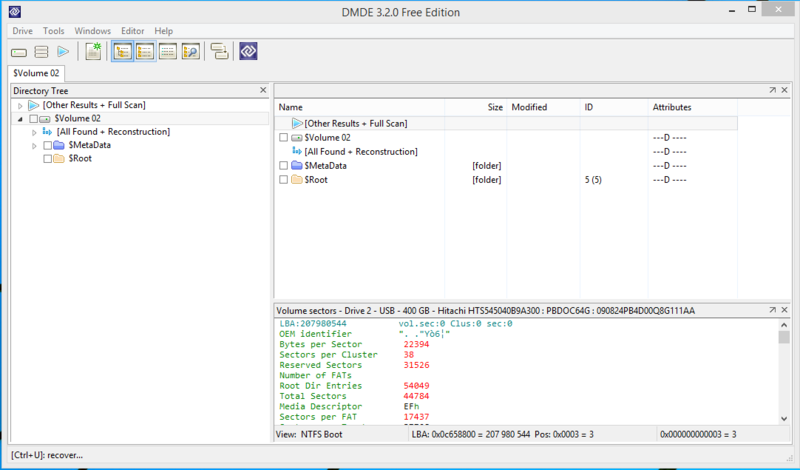 Can you show us the Partitions window in DMDE (freeware disc editor)? Chose this 400GB hitachi drive. Hope this is the right thing. I love working with jobs like that. But I charge. If you select "$Volume 02" and open it, do you see a file/folder tree (probably not)? The MFT (Master File Table) is the root of your file/folder structure. It appears to have been destroyed by the Linux install. I'm assuming that your drive was originally partitioned as detected by DMDE, ie 106GB and 294GB partitions. 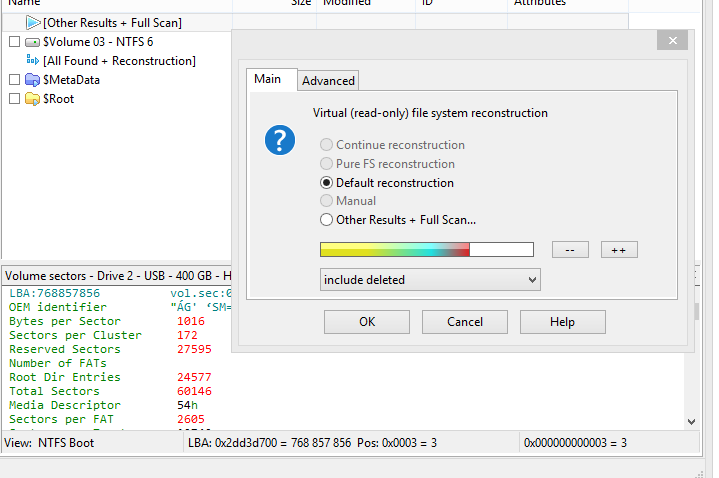 An NTFS search will scan the drive for NTFS fragments. If this does not prove to be fruitful, then a raw search may be necessary. A raw search tries to find files based on the signatures in their headers. You can adjust the sliders in the Scan Parameters to limit or expand the search area. 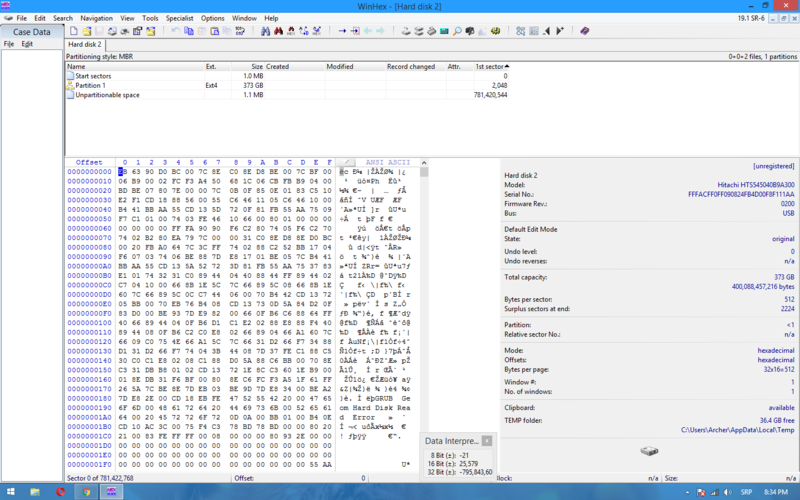 Got some fragments I guess (after NTFS scan). Tomorrow I will scan for raw if necessary now it's 12:30. If the original partition was 400 GB, then this is not the correct backup boot sector and you will need to search again. If the partition was in fact 300 GB then look at the location 207 980 544 and see what is there. If there is another boot sector there you are almost ready to rebuild the partition table. b) that was it's original location. If it was 2048 then the boot sector and MFT mirror will have been overwritten, but that can be recovered if the first copy of the MFT is available. I can write a boot sector if necessary as long as the main file system info is still intact. The entire drive's capacity is 400GB and it had only one partition that I used, don't know if any other existed and I used only that one for media (videos, pics, documents etc) so the partition cannot be 300GB I guess. Maybe it's ~300GB because I used about that much on the drive? Guess I'm going to have to do a 'raw' and 'NTFS' search. How do I 'take a look' at LBA63? How do I recover MFT with either of these programs? It appears that DMDE didn't find much. 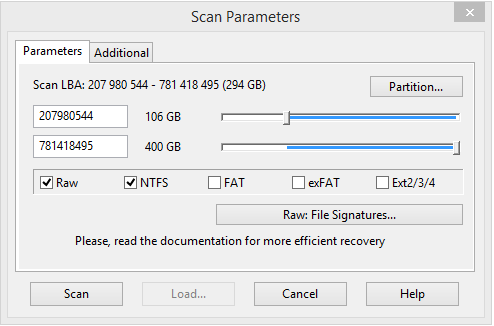 Try selecting each of the NTFS results and Open Volume. To go to a particular sector, select Editor -> Goto Offset. You can save the screen text by selecting Edit -> Export to Text File. Then paste the text output inside the forum's "Code" box using the BBcode button. .... I specifically chose my 100GB hard drive that I intended to use for this. Are there two physical hard drives in the computer, or one that is partitioned as 100 and 300 ? You can see in the first post on the screenshot there are actually three hard drives but I'm ignoring the 80GB one as it's where this Windows 8.1 installation is. That 400GB one had one partition, 400GB and it was used to store media. I selected the 101GB one to install the linux OS to but it took the 400GB drive with it, that's why I said "get ready for this one". Even after I was installing it it displayed usual warning like 'everything from this drive will be deleted' not 'everything from these drives'. Probably some bug in the installation of deepin, they are a relatively new distro devs. Should I just hit ok with default reconstruction or some additional settings? What have you tried so far? Your Linux probably over-wrote many if not most the data on that 400GB partition, that's my guess. I do not know how to advise you to reverse what happened. "Virtual reconstruction" is read-only, so DMDE will not write on your drive. However, it would be a good idea to clone the drive, sector by sector, rather than thrashing it with repetitive searches.